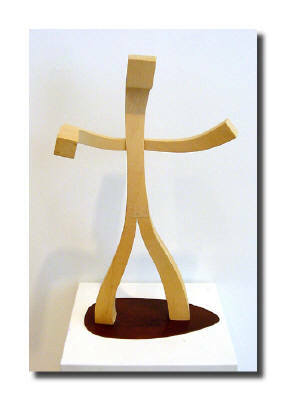 Dance with Me, wood, 22" x 14" x 7"
Eric Shaw was raised in Iowa City and took art classes at the University of Iowa. "My works are manifested in a variety of realms of sculptural expression, from cast metal and fabricated steel to sculpted wood. Inspiration for my art is primarily derived from nature, but my interests also lie at the other end of the reality spectrum in geometric and crystal forms. In many of my works I take elements of plant life, animal life, human forms, or ancient structures and combine them to create unique forms that are a synthesis, like a double exposure, of the endless architectures of the natural world. I try to create beautiful visions that are reality engineered - creatures and structures from a new time and place. My goal has been to create art using forms that people can identify with, can learn from, or can just enjoy. In my art I strive to celebrate the rich heritage of life and the structural beauty of the parts of our earth, and through that art, to wrest a respect for our neglected and real world."